Explore Bologna and its over 200 towers. 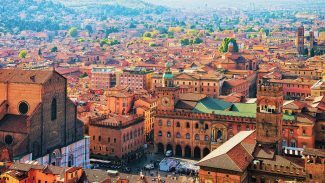 The Piazza Maggiore is considered the center of town Tamburini, while Ditta AF Tamburini is considered the center of Bolognese food. Gain a bit of background on Bolognese food with special guest Daisuke Utagawa. The Pinacoteca Nazionale displays a wider variety of art styles by Bologna’s famous artists.